I love my Solidoodle 3 3D printer for a number of reasons one of the biggest is that I love the fact that Sam Cervantes went his own way when the Makerbot printer was bought out by Stratasys and made closed source. 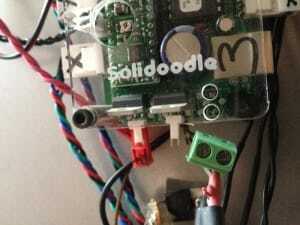 From that desision came the Solidoodle printer, my first step into the 3D printing world. As you may already know, I have heavily modified my printer to create Superdoodle, a 3D printer with a number of large upgrades. If you are interested in some of the modifications, you can find the articles here. 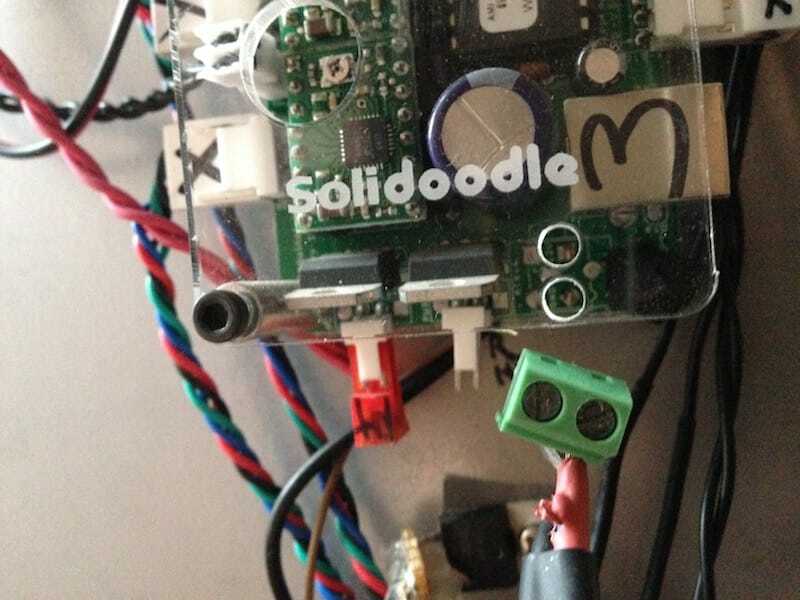 I also take the Superdoodle out and about, using it to show off 3D printing technology when I am doing demonstrations, or heading down to different Makerspaces. 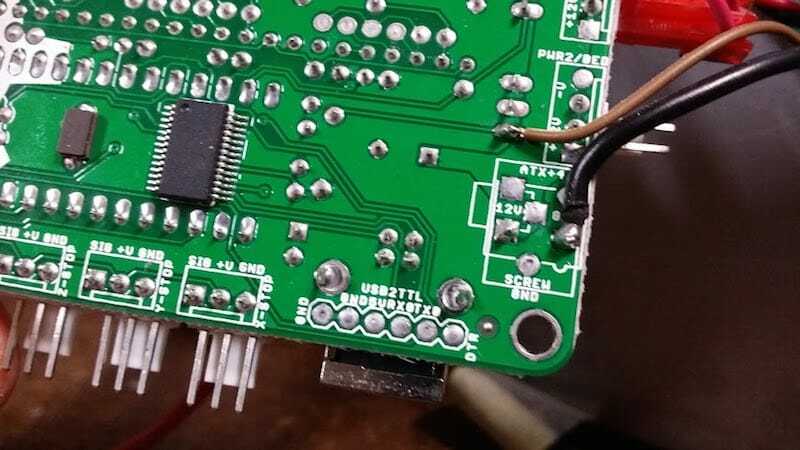 Over the years, the tape holding the cabling had failed, and when I went to print out my latest design last weekend, I noticed that the screw terminal to the electronics control board had been ripped free. This was a rather low point in Superdoodle’s life. 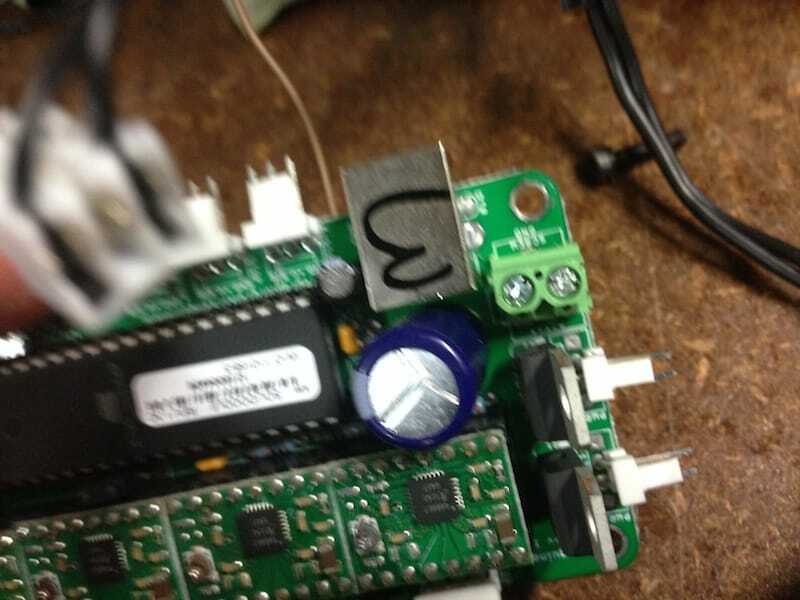 With the rain coming down in sheets thicker than lead, I ventured off to the only place open on a Sunday to find a replacement part, then drove across town to my maker sanctuary, the Connected Community Hacker Space (CCHS), to make my repairs. 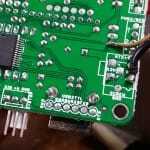 While I am a handy kind of guy, repairing electronic boards is not one of my favourite things to do. 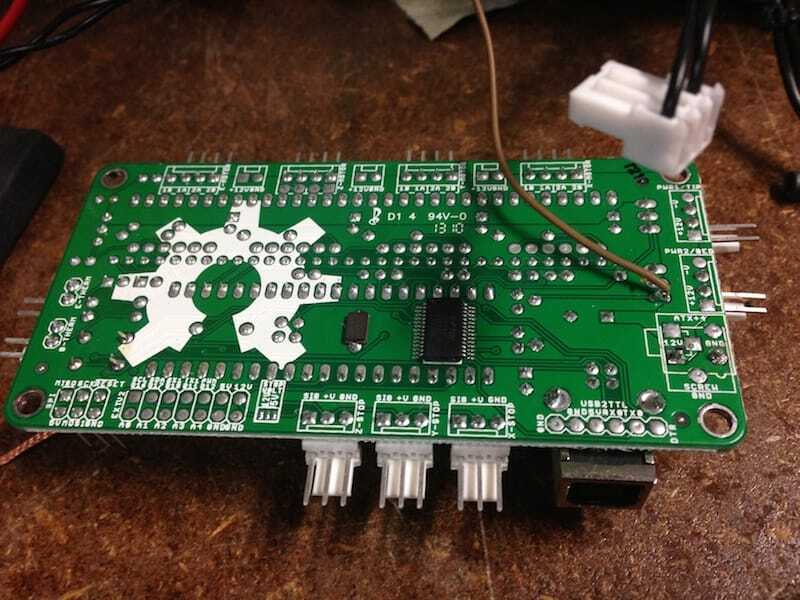 In the past when I have attempted to remove components, I have had the trouble of overheating the board and separating the tracks, leaving the connection to the replacement component broken. 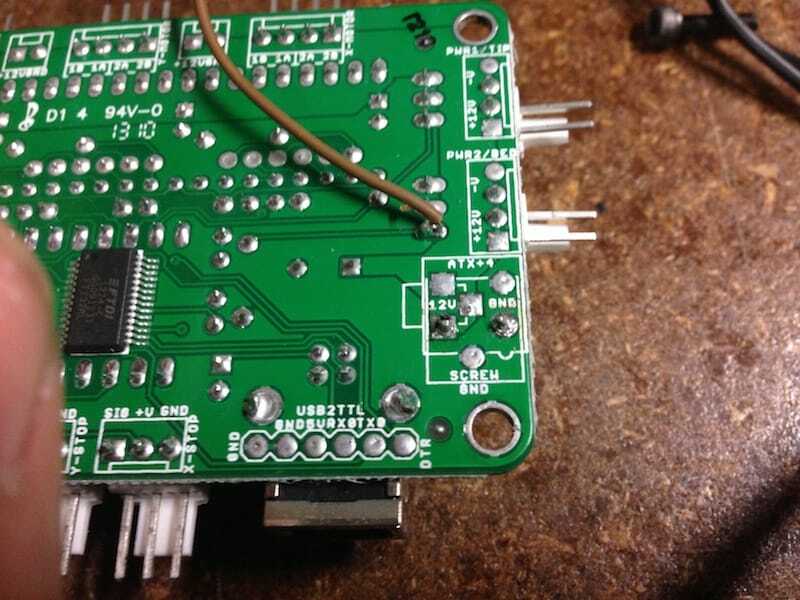 I didn’t want to wait for a replacement board, so I took it rather slow, and by reheating the original solder connections was able to get the replacement part onto the board with little problem. 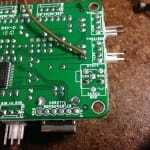 What was of more concern was the hook up cable that was soldered directly to the pad, which is used to control the modified heating bed that we installed as one of Superdoodle’s first modifications. Flip side with modified heat bed connectors on place. After reassembling and replacing the board, I had a tense moment as I attached the power pack back to the printer, with my hand hovered over the power switch. Holding my breath, I flipped the toggle and waited a second, the LED lights on the printer fired up and I began running through my shakedown list. Everything looked well until I tested the head bed, and the activation LED attached to the heating plate did not light up. 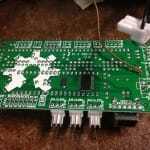 Thinking that I messed up the hook up wire, I started unscrewing the board from the printer when I realised I had not reattach one last set of wires to the electronics board. 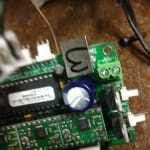 Attaching allowed the MOSFET to turn the heating bed back on, and I was back in business. In life, you need to savour the small wins, and this was one of those moments where I really enjoyed what I was able to do. Before the end of the day, I had repaired my 3D printer for a cost of 80 cents. If I had to get a new board I would have had to wait months for a replacement as well as face a hefty price tag. Now that everything is fixed, time to start printing.